In order to fully understand and take advantage of the benefits cloud-based remote practice management can provide you and your office, it is important to understand the basics behind it. First off, what is the cloud? If you’re unsure what the cloud even is. Let me catch you up. The cloud is “web-based applications.” An explanation given in an article on oralhealthgroup.com is that “the programs that you would normally install and run on your computer are instead installed on high-end servers at another location.” To access those programs, you only need a device that connects to the internet. If you bank online, shop online or even access social media online, such as Facebook, Gmail and Twitter, then you are currently using the cloud or web-based applications. 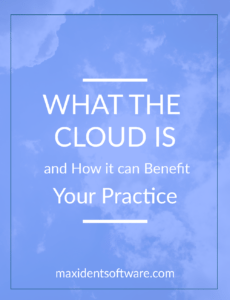 What are the benefits of the cloud to your practice? Now, if you are planning to become, or already are, a remote user and you aren’t using the cloud, it is important to understand just how easy the right remote practice management software can make your life. Your office can become a virtual environment. The same oralhealthgroup.com article suggests that cloud-based remote practice management software “can easily handle all the basic functions of a dental office, such as scheduling, billing, and charting.” This kind of software is not so much the future as it is the here and now, so why not future-proof yourself and your practice. Why is Maxident Anywhere your number one choice? What is the best choice when it comes to the right remote practice management software? It’s the choice that gives you the freedom to access your software from anywhere on any device, including your smartphone, your tablet, or your laptop at home. It’s the choice that gives you the capacity to collaborate from multiple locations. It’s the choice that offers an experienced and friendly Dedicated Success Team (complete with a support technician and an account manager) to handle any problem, and it’s the choice that is the most affordable, the most reliable, and backed by over 30 years of continuous development. Maxident Anywhere is software revolutionized and offers all the services of Maxident without the high startup costs of unnecessary servers. You are not required to buy software, pay any powerful server or workstation costs, and you can benefit significantly from MaxiChart and MaxiVault (a powerful team of add-ons to allow for digital charting and secure cloud backup). The cost is lower too, reducing the stress and financial strain of being a busy, on-call oral health provider. If you’re interested in learning more about Maxident Anywhere, please don’t hesitate to contact Christian at 1-800-663-7199 ext 203.